In this tutorial, we will discuss how to audit data and generating audit logs and data history entries using JaVers in a Spring boot and MongoDB environment. Troubleshooting purposes. For example, when an error around an entity occurs, it would be great to know which change triggered a certain bug. Security purposes: Maintaining an audit log is extremely important when it comes to security. For example, checking who changed specific data sets, or finding out what was changed in order to investigate a security breach. Analytics: Tracking and analyzing data changes provides you another point of view into a user’s behavior. It allows you to learn how the user interacts and changes data in order to create new functionalities and improve existing ones. Data restoration: Mistakes happen. And when they do, it would be great to restore data to its original state. For example, if you make an editing mistake, then having an audit log allows you to view how data looked like before your edit and allows you to restore the data to its pre-edit state. JaVers is an open source framework that provides auditing functionality in object oriented data environments. Javers allows developers to log changes to their entities into a JaVers repository, which can later be used to perform change auditing and tracking tasks. It is open source and free to use. It is compatible with both traditional relational relational database systems as well as NoSQL systems. This makes migration between RDBMS and NoSQL much smoother. Easy integration with Spring and Spring Boot. Integrating Javers into a Spring boot application is quite an easy task, thanks to Spring boot’s auto-configuration functionality and the existence of JaVers’ Spring boot starter module which takes advantage of the auto configuration functionality of Spring boot to get up and running very quickly. In order to pull in the dependencies required to get started with JaVers in a Spring boot and MongoDB application, you will need to add the javers-spring-boot-starter-mongo dependency to your POM xml. By default, JaVers will perform any auditing unless you explicitly mark your repository for auditing. To do this, you will need to use the @JaversSpringDataAuditable annotation on the repositories you would like to audit. By adding this annotation, you now create an audit entry for each create, update or delete operation you perform in the database. Now, let us try out our brand new audit library configuration. For this, we will modify our CommandLineRunner application slightly by performing a modification and a deletion operation on our test data. This is our auditing framework persisting log data into our database. 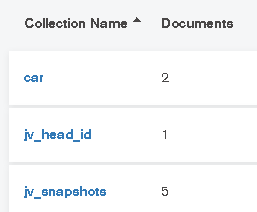 If we go to our MongoDB database, we will notice that JaVers added two new collections. Initial : This indicates a create operation in the database. Update : Indicates an update / modification operation. Terminate : Indicates a delete operation has been performed. commitMetadata: This includes valuable information such as the author of the change, the time of the event in local (commitDate) and UTC (commitDateInstant). The author here is mentioned as “unauthenticated” as we did not configure any authenticion into our spring application using spring security. We will explore this in a later tutorial. globalId: Contains information about the entity being modified and its database id. state: Contains all the field values of the entity being modified. Please note that this is the state of the object after the change has been performed. changedProperties: This includes the fields that have been modified in this audit log entry. 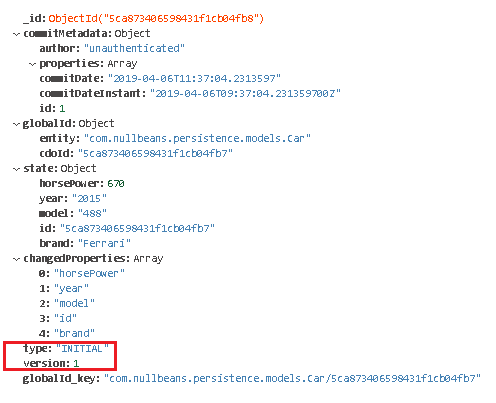 Since this is a creation operation, all fields have been included in the changed properties array. Notice that now, only the horsePower property has been included in the changedProperties list. Also notice that the version has been incremented to 2. Since the object has been deleted, the entry log type here is “TERMINATE”. Notice that the changed properties array is empty. Our final step here is to figure out how to access the audit logs data from our Spring boot application. For this, we simply need to obtain an instance of JaVers from the application context and search for changes for a specific car. For this, let us modify our CommandLineRunner implementation again and add a simple query to search in the JaVers snapshots collection. 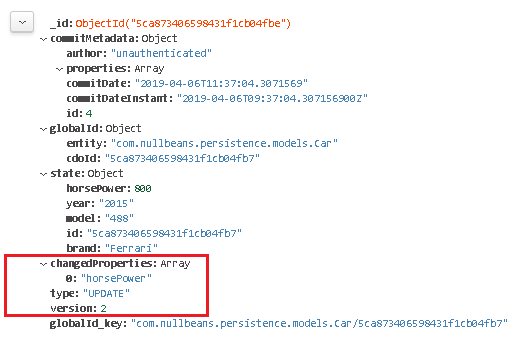 In order to get the JaVers instance in our simple application, we simply need to autowire an instance of the bean. Please note that JaVers provides a very powerful querying API. We will explore more search functionality in later tutorials. In this tutorial, we discussed briefly what is JaVers and why it may be a good fit in a Spring boot and MongoDB stack. We then discussed how to integrate JaVers into Spring boot by adding the required dependencies and how to enable auditing for a spring repository. We then tested our example and discussed what is stored in the JaVers snapshot MongoDB collections. We then discussed a brief example for querying for JaVers entity history snapshots.